Hello folks! My name is Chief Constable Odo, but everyone just calls me Odo for short. 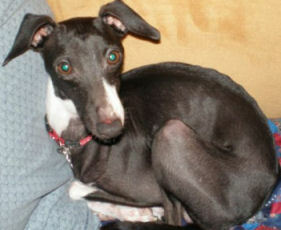 I am an Italian Greyhound and I was born on May 18th, 2007 in Nanaimo BC. I live with my humans Shawna and Michael, my canine sister Wasabi, and felines Smokey and Ginger. I started playing flyball because my mom Shawna loves the game, and figured I should do it too. It's a good thing that she is persistent, because I didn't make it easy on her! Her biggest challenge has been getting me to.. Oh! Look, a leaf on the wind! .. Umm, er, getting me to stay focused on the task at hand. Her biggest success was getting me to fetch a ball. I ran my first full "public" run at a demo in September 2009, but with all those distractions at a tournament, Mom is taking her time with me. When I am not at flyball, it is my job to police the cats in the house. I know them by name, so Mom can tell one of them to stop doing something (get off the table, don't chew that etc.) and I will run up to them, swat them with my paw and pull their tail until they stop. I also keep them out of the bedroom. My favourite tricks are jumping into Mom's arms and playing dead. My favourite toy is a squeaky reindeer stuffy with floppy limbs that I carry all around the house. When it is time to chill out, you'll find me in the bowl chair or the nearest sunny spot.